from "Angels With manky Faces"
From the play,"She's Just Nipped Out For Fags"
We enable our adult members, young people and Members with Learning Difficulties to gain experience and skills in all aspects of performance to increase their confidence, self esteem and life skills and to improve their education and employment opportunities. 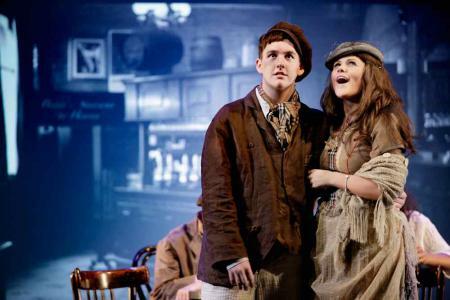 As well as offering accreditation and employment we also devise and perform original plays at numerous professional theaters throughout Greater Manchester. Manchester is ranked one of the most deprived area's of the country (IMD). North Manchester where we run the project is an area of multiple deprivation. Risk factors as identified in Manchester's Children and Young People's Strategic Plan 2010 -2012 'low self esteem and poor aspiration, experience of educational disadvantage, living in an area of multiple deprivation and poor levels of attainment' (section 8:40). The young people need the activity as it addresses these risk factors. The impact within the community is that young people have a positive alternative to committing antisocial behaviour and therefore making the community a better place to live. The activity is an opportunity for young people and adults to present themselves in a positive way, performing a play to an audience gives an enormous sense of achievement and pride for all and builds a sense of community. The plays give a voice to the community as they highlight issues that are relevant to them.